Joe Shemtov is a Special Collections Coordinator and Primary Source Specialist, and a participant in Cohort 1 of the Skills for Community-Centered Libraries trainings. In October. I had the pleasure to complete Skills for Community-Centered Libraries, a series of four half-day workshops centered on helping library staff develop and assess successful community based programs. Working in Special Collections, the workshop was challenging. It helped me to raise the following question: "How could we in Special Collections explore innovative programming which would use our collections to meet the needs of, and impact, local communities?" Among the many collections from which to choose, I focused on our collection of Islamic manuscripts. 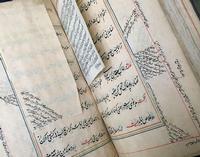 It recently garnered a lot attention because of a $500,000 grant from the Council on Library and Information Resources (CLIR) awarded to the Free Library—and to the University of Pennsylvania, Columbia University, Bryn Mawr College, and Haverford College—to digitize and catalog its Islamic materials in order to make them freely accessible to the public. With the digitization and cataloging effort underway, the time had come to begin thinking about creating community programs. But how would I begin to identify my target audience? And how best could I reach out to them? Fortunately, on the last day of this training workshop, I met Shahadah Abdul-Rashid, a Community Initiatives Specialist for the Free Library. I introduced Shahadah to our collections and we discussed various ideas. She then suggested that I begin my outreach efforts by reaching out to Philadelphia Islamic communities. Her recommendation was on point, given that Muslims represent ten percent of the total population of Philadelphia, shaping and enriching the city’s way of life. Shahadah was instrumental in coordinating a meeting between the Free Library with the Majlis Ash'Shura of Philadelphia and Delaware Valley, a consultative body of imams, masjids and Islamic organizations representing the Muslim community. On January 9, 2019, the Rare Book Department hosted a delegation of five imams from the Majlis Ash’Shura. This visit turned out, at least for me, to be an unforgettable experience. The imams educated us about Islam and its rich history, and were captivated by the display of manuscripts we shared with them. Imam Yahya Abdul-Latif was so moved by one of the Qurans on display that he recited a part of the Quran which he knew by heart. 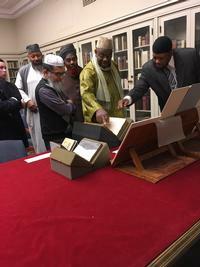 This was an important step between the Free Library and leaders of Philadelphia's Islamic communities, as we begin a much needed dialogue on how the Free Library, with its outstanding collection of Islamic manuscripts and paintings, can begin to create impactful and long lasting programs that will meet the cultural and educational needs of Islamic communities within Philadelphia. The Community-Centered Libraries trainings are made possible in part by the Institute of Museum and Library Services [Grant #RE-95-17-0089-17]. 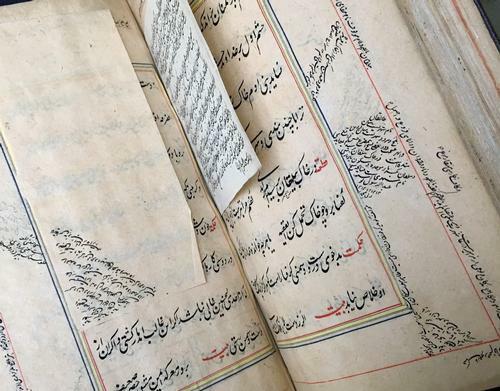 The Islamic manuscripts project is supported by a Digitizing Hidden Collections grant from the Council on Library and Information Resources (CLIR). The grant program is made possible by funding from The Andrew W. Mellon Foundation. Joe, this is amazing! Excellent work! Great work, Joe! And that photo of the imams is awesome! This is an extraordinary. To grace Philadelphia also known to be the City of Muslims. This magnitude of knowledge. is exemplary of exhibits that have been contained for hundreds of years. The release of archival classical islamic history. Definitely would allow the many scholarly both males and female academians across the City as well as. those who would thoroughly enjoy this research in their studies. On the straight path.